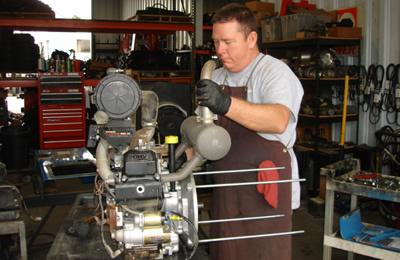 Service & Repair | R.J. Kates Co.
Our team of service technicians has over 80 years of combined experience troubleshooting and diagnosing equipment problems. We hold warranty station status with all major welding and cutting equipment manufacturers, and offer fast, easy turnaround to get you back up and running quickly. 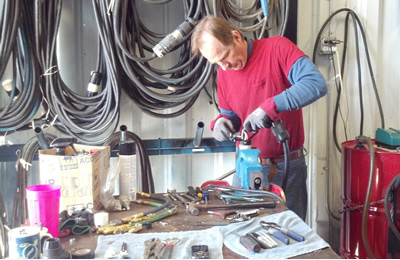 R.J. employs factory-trained technicians who possess advanced experience in repair and operation of all welding equipment. After we receive your machine, we typically diagnose the equipment and provide you with a detailed estimate within a 24-hour period. We inventory many of the parts necessary to make immediate, complete repairs, which help you reduce your company’s down time. We ship directly to you from our large inventory or drop ship from the factory. Second-day or next-day delivery is available!. Our technicians can offer technical expertise in many welding and cutting processes to assist in your manufacturing and production needs. 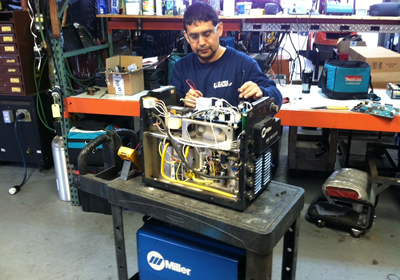 We are authorized for Miller Robotics, JetLine automatic welding equipment, Hypertherm CNC motion control and Cyclomatic automatic welding equipment, as well as many other manufacturers. We also specialize in integration of equipment components to update your existing cutting machine. Our sales technicians have over 80 years of in-depth experience in welding and cutting process requirements and can exactly specify the system and supplies your job requires, from light manual processes to integrated automated systems. We also have used equipment available for purchase, some with remaining original manufacturer’s warranty. All used equipment offered for sale undergoes an extensive inspection and restoration process. You get solid, reliable products at the best price. We stand behind all equipment sold. If you are in the market for used equipment, visit our used equipment page or please give us a call.